Earlier today, I was trying to finish preparing the poster for the Clinical Trials Methodology Conference $-$ I'll have both the poster presentation (on the Expected Value of Information under mixed strategies) and my talk on the Stepped Wedge design on the Monday, so by 3pm I'll be just wandering around the sessions having done my duty. Luckily, XY slept a couple of hours, so I could actually do some work. But then he woke up and while he was playing in the living room, he found my badge from the Chemometrics Workshop and the latest copy of Significance. 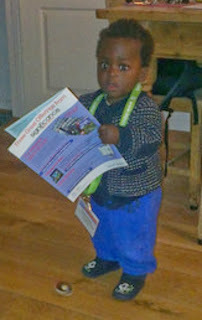 I did put the badge around his neck the first time, but he quickly learned to do it himself; at which point he kept putting it on, while carefully reading the magazine. I think he quite looks the part, doesn't he?